On YouTube there are several instructional videos showing how to fill in the stampings and engravings on firearms with color. Some use crayons, others use nail polish, paint pens, Testors model paint, etc. Some of these videos advocate heating items with a brazing torch (!) and use of harsh chemicals. I have yet to find one that actually uses the product purpose-made for these projects: Laquer Stick. Used like grease pencils, you just rub / smudge the compound into the markings you want to highlight and then wipe away with the excess with a cloth. [I to use 100% cotton patches to prevent any chance of scratching.] After a while it dries and becomes permanent. You can degrease with rubbing alcohol or mineral spirits beforehand if you want, but I don’t always do that. The surface of the marker will dry between uses so the next time you need it, just take a knife a slice off the dried layer to expose fresh compound. And they go a long way; at $5 per stick, one of each color you want to use is pretty much a lifetime supply. While I generally don’t feel the need to advertise the makers’ marks on my firearms (Flair! ), I do enjoy being able to quickly discern which flavor of Glock magazine I’m looking in the back of the safe without having to shine a light on it. 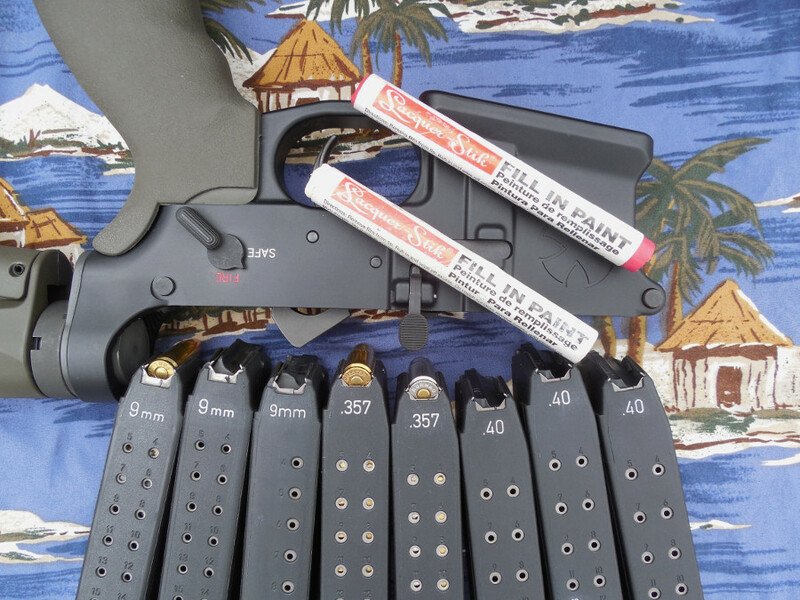 They are also useful for highlighting the round count numbers on magazines or safety selector marks on receivers. A product reviewer on Brownells website used it to fill in engraving to prevent rusting of the bare metal. So avoid the ‘Crayon and Flame’ method and do it right.